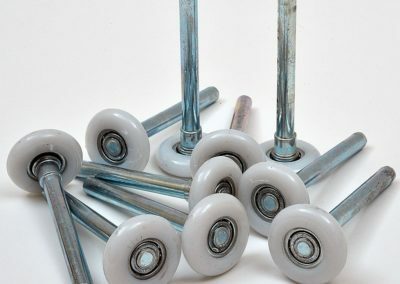 Garage Door rollers are one of the most wearable parts on a garage door. The amount of rollers you have usually depends on the number of panels or sections your garage door has. There is a large variety of rollers in terms of quality. 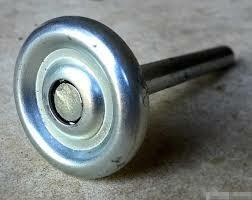 Many builder grade garage doors come with a plastic roller that do not have any ball bearings. 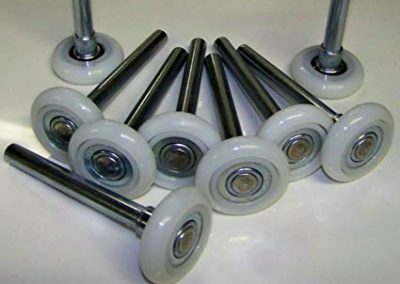 These rollers tend to drag and cause the garage door to feel much more stiff while operating manually as well as cause your garage door opener to work harder lifting the garage door. Viking Overhead only carries the best in garage door rollers. 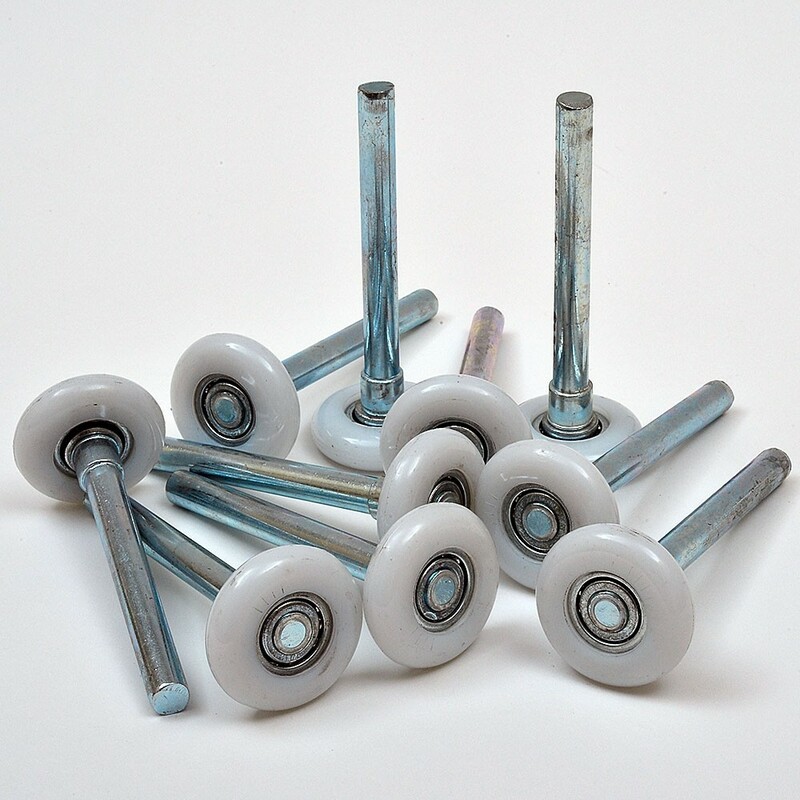 All of our garage door rollers have a steel shaft and ball bearings with a nylon head. This allows the door to roll much more smoothly and take unneeded stress off of the garage door opener. The nylon roller is designed to grip the track and promote rolling rather than dragging as well as providing quiet operation. Although nylon coated ball bearing rollers are the preferred choice for residential applications, there are commercial doors that depend on roller strength over the quietness of the nylon coating. Whether your door requires steel ball bearing rollers or nylon coated ball bearing rollers we highly recommend either of these options over a builder grade roller without any bearings at all! When researching and choosing the right garage door roller for your door you should consider choosing a roller with the highest number of bearings in the roller. The amount of bearing usually range from 7-13 with the higher number of bearings usually being the better quality roller. Good quality garage door rollers typically have 11-13 ball bearings per roller. 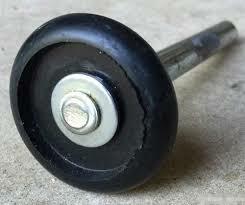 Garage Door Rollers also come in 3 standard lengths. Standard residential garage doors usually only require “short stem” rollers. Short stem rollers have 4″ stems. “Long Stem” garage door rollers have either a 7″ or 9″ stem depending on the application. There are also 2 different roller head sizes. 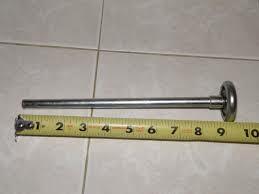 A 2″ diameter roller head is standard for most residential and commercial garage doors however a bigger and stronger 3″ roller head is also made for over sized and heavy weighted garage doors. If you have any questions or would like to have your garage door rollers serviced feel free to give us a call at (817) 600-4224 to schedule your garage door service today!